This issue would (for me) be a great cause of embarrassment. Even simple things like checking the patch level are impossible, let along attempting any kind of restore. It's indeed a known issue related to usage of non-default DPI. However, as stated above, we aware already and will be working on addressing it in the future releases. Thanks. I know you are aware of this bug, but we have end of October now and the this thread started in January. Sure we can disable DPI scaling to 100%, but have you ever worked on a Surface with 100% DPI? I'm sure I'm not the only one Admin who is using a Surface, so if someone at Veeam could finally increase the priority level of this bug we all will appreciate. Maybe you could just release a hotfix insted waiting for Update 3. I do not believe there are any fixes for this in 9.5. Correct, 9.5 release will not change the observed behavior - but we do plan to gradually address this in the following releases. This is a significant undertaking as basically we're talking about reworking and then retesting the entire UI (hundreds of dialogs with thousands of controls). When I open an element like "Edit..." a job, the window is misshapen ! There's always a white square of a description on the topleft. So I can't edit anything. The server has restarted 3 days ago. Maybe Windows update ? Yes, unfortunately, this is a known issue. 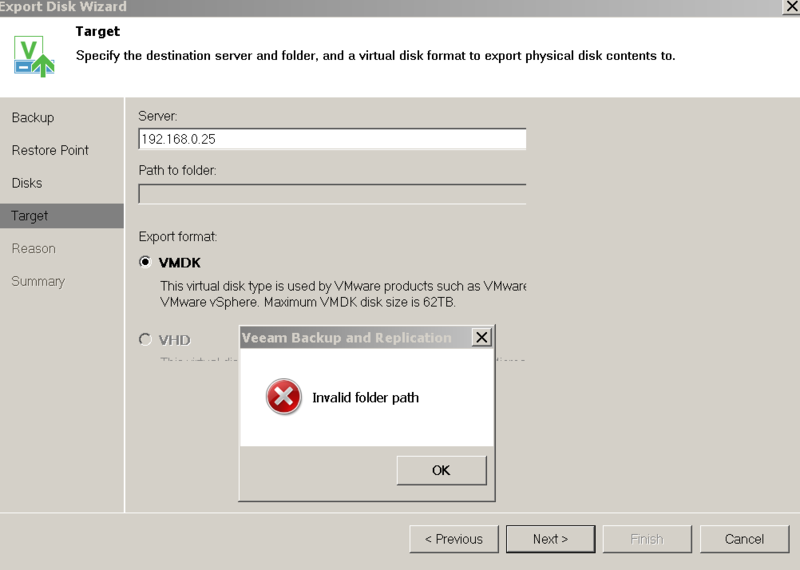 You need to set DPI parameters to defaults when using current version of Veeam B&R. Ok, I second this and want it bumped. There is certainly a majority of screens selling today with higher resolutions than 1920x1080 and a lot of serious system administrators uses these high DPI screens. We urgently need a fix for the console issues we are seeing here so we can work properly without workarounds (old 2008R2 TS servers without scaling etc). What is the current status? Is this even being worked on? Atleast with the vSphere client we can disable scaling by the shortcut properties but this does not help in the Veeam B&R Console. Andreas, thank you for the feedback. No urgent fixes are available for this issue, however, we're keeping this in mind for our next releases. [MERGED] Can't select "path to folder"
I am trying to make a restore. Usually i have a dropdown menu in PATH TO FOLDER where i can select the destination. This is a clean installationl. What should I do to have the PATH TO FOLDER populated with possible destinations? Re: Can't select "path to folder"
This looks like a UI glitch. Can you please provide Veeam B&R version you are using and the existing DPI value in monitor properties? As a workaround try to set DPI value on this computer to 100% and restart Veeam Console and this specific wizard.